iv 美国光学会. Lutein & Zeaxanthin. http://www.aoa.org/patients-and-public/caring-for-your-vision/diet-and-nutrition/lutein. Accessed April 23, 2016.
v 生活科学. ω-3脂肪酸有助于防御眼科疾病Omega-3 Fatty Acids Protect Against Eye Diseases. http://www.livescience.com/12801-omega-3s-protect-eye-diseases.html. Accessed April 20, 2016.
vi All About Vision. 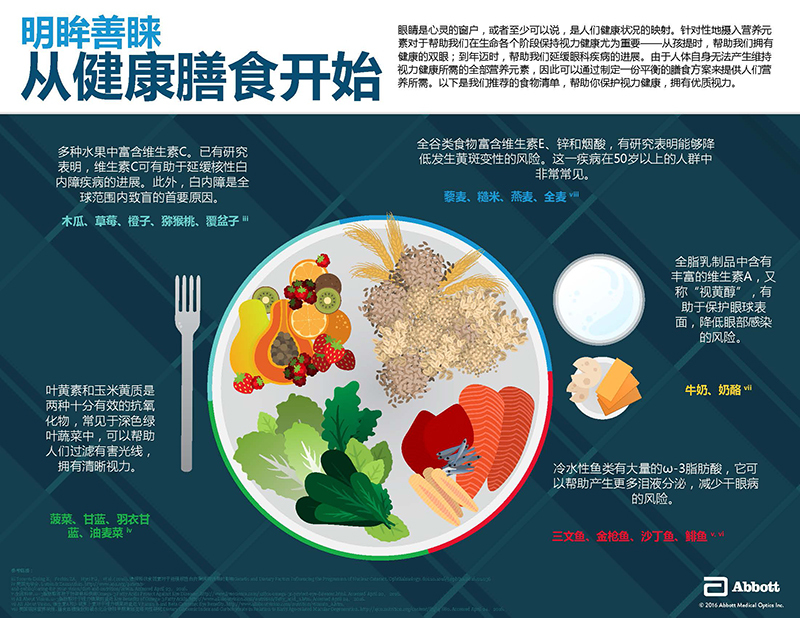 ω-3脂肪酸对于视力健康的益处 Eye Benefits of Omega-3 Fatty Acids. http://www.allaboutvision.com/nutrition/fatty_acid_1.htm. Accessed April 24, 2016.
vii All About Vision. 维生素A和β-胡萝卜素对于视力健康的益处 Vitamin A and Beta Carotene: Eye Benefits. http://www.allaboutvision.com/nutrition/vitamin_a.htm. viii 美国临床营养学报. 膳食血糖指数和碳水化合物和早期黄斑变相关性研究 Dietary Glycemic Index and Carbohydrate in Relation to Early Age-related Macular Degeneration. http://ajcn.nutrition.org/content/83/4/880. Accessed April 24, 2016.